Got here from Carl Zimmer's place, and am struck by both the tattoo and your work in translating the Berkeley site and Dawkins' book. Particularly the former has to be labors of professional love, and it's as admirable as the tattoo. It's been a long time since you have posted this comment and because of some setting of the comments in my blog, I have just seen it. Thank you for your kind words. Translating the Berkeley website and Dawkins' book has been such rewarding experiences for me. Not only I learned immensely, but also I've met wonderful people on the way. Dawkins translation was not a volunteer job, however Berkeley translation is a volunteer work and I believe everyone should be involved in such organizations because it is both good for the society and good for personal development. Ben Ekin, Edinburgh Universitesi'nde biyoloji phd ogrencisiyim. Berkeley'nin evrim sitesini turkceye cevirerek cok mukemmel bir is yapmissin. Kesinlikle boyle bir turkce website a ihtiyac vardi! Darn! I hate you for being more clever than I am! I love this idea and the design; now the bar is set for me to come up with a brilliant tattoo of my own. Congrats on a beautiful piece of art. hey, there... i've looking for the greatest tatoo for my own and i have find it here!!! i'm an engenner's graduate student from brazil and love science. i was looking for a tatoo like an physic's theoremy, but when i saw that one, i just change my ideia. next week, i'll take this on my right shoulder. i'd like to tell about it. so... kisses. Hi Paloma, I am really glad you like my tattoo :) Let me know how yours turn out! Good luck! It was wonderful to see images of the tattoo on line and, by pure chance, meet the person who had it. Like I have told you a thousand times, it is the most perfect tattoo I've seen in my life and I love that it is a representation of evolution... you have thousands of years of divergence represented on your shoulder blade and the insight of the person that changed the study of nature forever! I love the artistic idea of the butterfly figure the finches make and the fact that they look so realistic, for I find those to be the most beautiful tattoos. The cool tattoo matches the cool owner! Just curious, would it bother you if I got a similar tattoo? I love the four finches but, I don't want to infringe on your creativity. Hi! It makes me really happy that people like this tattoo. I'll be honest, though, I would have liked to be the only one who has this tattoo in the purely primitive megalomaniac sense of being human :) However, I know that is completely unrealistic. In the end, even though this design is special, Darwin's finches are not mine :) And it is only natural that people want to have something they like for themselves as well. Hello, Duygu. I saw just now your reply to me above. Sorry for the long time no here. So, how are you? 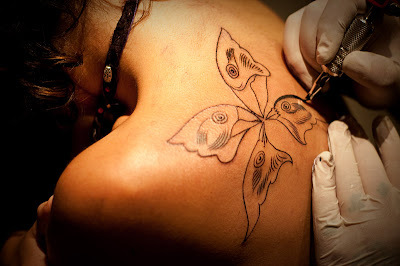 I hope nice :) I came here again to say that I still did'nt make the Darwin's finches tattos, like I said before. My tests on university just have got started, and I have being very busy. Though, I'll make it soon as I can. I love your idea that you said for xtothisdayx: "In any case, it is so nice of you that you asked. 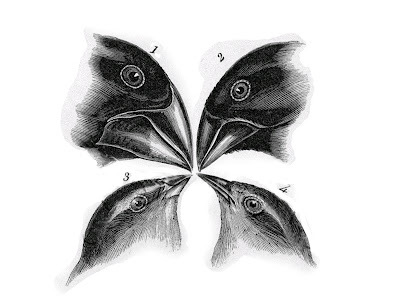 Actually really started liking the idea of having a little collection here on this blog: a collection of Darwin's finches tattoos :) So, if you ever get this tattoo, can you send me a picture of it, so I can post it on the blog? Finally one day, there will be so many of us, we can be a clan or cult or something :)"
Could I send you a picture of it when it has been done? :D Maybe we could post our pictures together. I really like this design; do you have any higher resolution version image so I can put it on a coffee mug or something? I also got here from Carl Zimmer's blog. Perfect execution of your idea. Really like that butterfly shape with hidden message for other scientists/nerds ;). Duygu! that is such a cool tatoo, I did not have a chance to look at it in Chile. I love it!! I really love this tattoo. If you don't mind, may I get this done as well? I've been wanting to get it done for way to long (over a year) so I figured I'd ask. I hate to copy you but it's just so damn perfect for what I'm looking for in a tattoo. You put a lot of time and effort into knowing all about Darwin's finches but what do you think I should know? If it's ok with you for me to copy you, I feel like I owe it to you to at least gain the knowledge that you find appropriate. I'm not a biology major or anything but I love the field. But maybe your passion is to get beautiful tattoos on your body, I do not know! Basically, what I am saying is, getting a tattoo of something you are not even knowledgeable about is a concept I cannot wrap my head around. But you are welcome to get the same tattoo. (However, if I were you, I would wait to feel very passionate about something, and get a tattoo that represents that). Thanks for the reply. 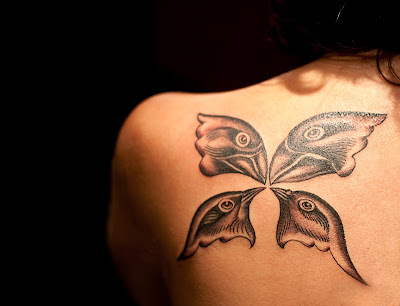 I'm mainly wanting to get a tattoo that represents evolution. For a wielder/machinist I know a lot about evolution but compared to an actual biologist I'd know very little. Evolutions a passionate hobby of mine and reflects my view on life. I'm looking for tattoos that will tell a story of who I am and what I believe. If I do get this one, I'd change it up a bit but it would still have the butterfly concept. Hi again. For some reason, I did not receive a notice about you comment and it ended up waiting moderation for months to be published. I do not visit my own blog much, so I have just seen it. Sorry for the delay. Initially I might have misunderstood your first comment thinking you do not have much of an interest in evolution at all. I am glad you wrote back and cleared the confusion. I hope you'll enjoy having whatever tattoo you get (or maybe you have already gotten), and you certainly do not need anybody else's approval/blessing. :) Definitely not mine. If you wish, I would love to see a picture of your version of the tattoo! 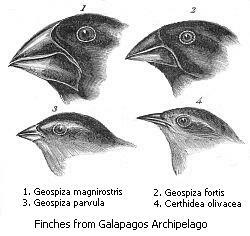 As for learning more about finches, I can recommend a book called The Beak of the Finch by Jonathan Weiner. The book is about Peter and Rosemary Grant, which is a couple who have been conducting research on finches in the Galapagos for years and the book tells their story. Weiner won a Pulitzer Award for his work. You will love it. If you would like to get some raw scientific information, check Abzhanov's work (http://www.oeb.harvard.edu/faculty/abzhanov/). He is a researcher at Harvard working on the evolution and development of the finches, analyzing genetic mechanisms behind the variation of beak shapes. Oh wow... thank you so much. This means a lot to me and means even more that you gave me the OK. I have one question though. Is there drawings of the seeds (or other food) that these finches ate. I'd like to have the food incorporated with the tattoo if I can. I plan on arranging them in the middle somehow, maybe to make it look even more like a butterfly. I figure you'd be the best person to ask.I plan on getting it sometime next month if I can. I'll be sure to post pictures of it and let you know how it goes. This is Asron87 again... do you still read these comments? I finally got the tattoo done and was wondering if you still want to see it? I'd just like to thank you again for your approval. The tattoo really means a lot to me because of what it stands for. It captures what I was wanting perfectly. Thank you so much! Here ya go. This is the only pic I have of it but I can get more if you'd like. The only thing I told the tattoo artist was to try to keep the beaks as close to original as possible but also try to make it look like a butterfly. Between the birds you can see "ink blots", it shows a little more outside what this picture shows though. I'm really happy with how it turned out. That is such a great and unique version! I am glad you are happy with how it turned out, which is the most important. Thanks for sharing a picture of it!